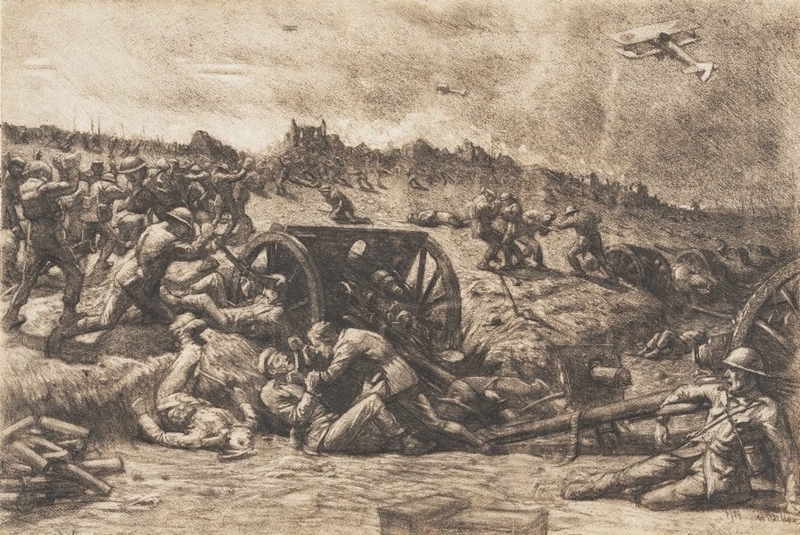 'A historic and exceptional incident on a Bullecourt sector. It was exceptional because it is seldom that an artilleryman gets to close grips with the enemy. In April, 1917, the Germans captured a number of the guns of the 1st Division, Australian Artillery. The infuriated gunners immediately counter-attacked, and in the most unorthodox manner. Not only the gunners, but every man available - cooks (with huge meat knives, axes, etc. ), drivers, and orderlies - rushed in admidst the greatest disorder, a howlin, cursing, but determined rablle, and not only succeeded in recapturing their guns, but also in securing a large number of prisoners'. Signed l.r. "M. Napier Waller". Not dated.